ROCO 78656 - Electric baggage railcar De 4-4 1668 SBB Electric baggage railcar De 4/4 1668 of the Swiss Federal Railways. Epoch IV. Motor with flywheel. Drive on two axles. Two wheels have traction tyres. AC model with integrated load-controlled digital decoder. 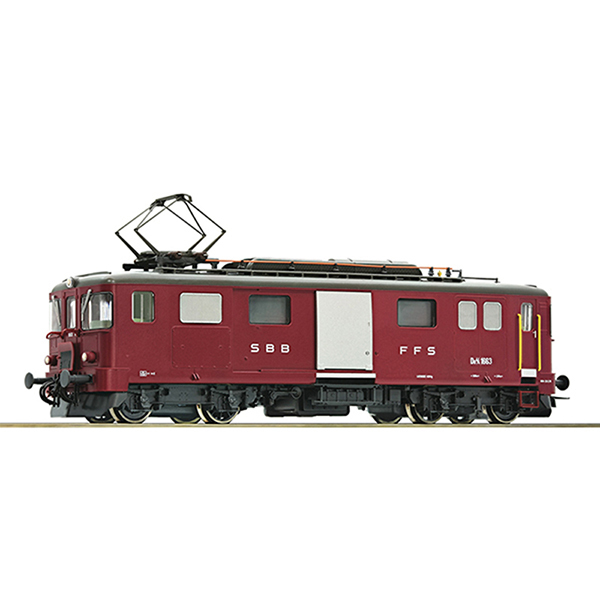 In the mid-1920s, 24 baggage railcars Fe 4/4 were built for the Swiss Federal Railways. The railcars 18501-18508 were converted in 1930 for the use in the Seetal valley. They were equipped with an electric brake, among other things. In 1963 the designation of the railcar was changed to De 4/4 1661-1685. From 1966 on, major conversions were made on eleven railcars (1661-1671). The old wooden chassis were replaced by steel structures, and the driver's cabs were outfitted with new seating facilities to easily operate the railcars. At the end of their careers the railcars operated on the railway line “Seetal” Luzern-Lenzburg and in the Vallée de Joux between Vallorbe and Brassus.